In the years that I’ve been blogging, I can generally count with my fingers the number of times I’ve gone out to meet other bloggers. I’ve never really been active with blogger events. In fact, in the last couple of years, I hardly even visit new blogs. I still visit and read those that I’ve been constantly reading for years, but I don’t bloghop much anymore. 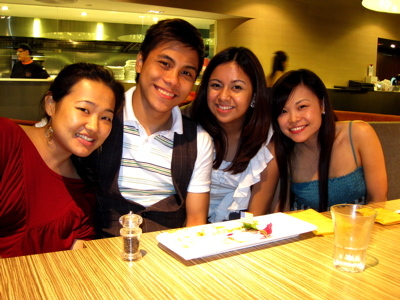 But eversince I moved here in Singapore, meeting other bloggers has somewhat become more fun for me. Perhaps having a great time meeting Ederic, Alex and Leonard last December made me more excited about meeting new people. 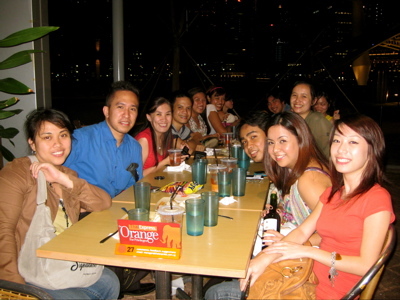 So last week, I was glad to meet with other Pinoy plurkers/bloggers over dinner and a round of drinks after. I met up with April, waited for JR to get off work (web programming jobs, yo! ), then walked to The Esplanade. I’m happy we went, because it was a definitely one great night with yummy Thai food, free dessert, free wine too (!!! ), and fun (funny? =P) company. I’ve been blogging for almost nine years, and even if I’ve gained quite a number of friends throughout that time, I’ve only met a handful of them. I was never really active in blogger meets and events. I think it was about time that I expanded my network here in Singapore, so last week JR and I had dinner and drinks with Ederic, Alex and Leo. Finally got to have dinner with two of my ex-officemates. Carlo was in town and stayed with Dianne for a couple of days, so I made sure to meet up with them for dinner after work last Monday. 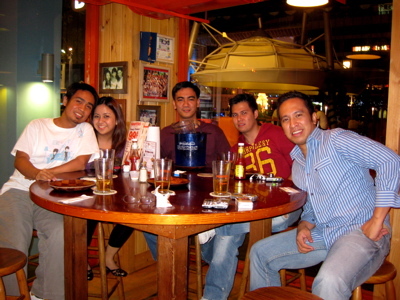 Dots, Carlo, me and Dianne (4/7 of the Boracay 2007 crew). 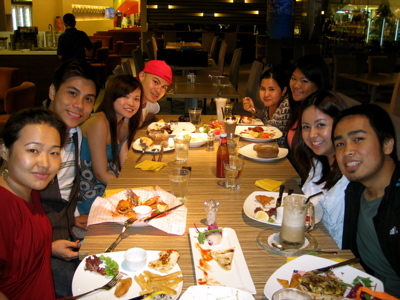 With the whole bunch at Earl Swensens, Vivo City.